Napoleon Bonaparte was a voracious reader. He had a personal librarian, he always travelled with books, and he took a great interest in constructing the ultimate portable library to accompany him on his military campaigns. Napoleon’s taste in books was primarily classical. He had some lifelong favourite authors, including Plutarch, Homer and Ossian. What else did he like to read? Napoleon soon parted ways with Rousseau, but his admiration for Ossian continued throughout his life. He even reads Ossian in Napoleon in America. 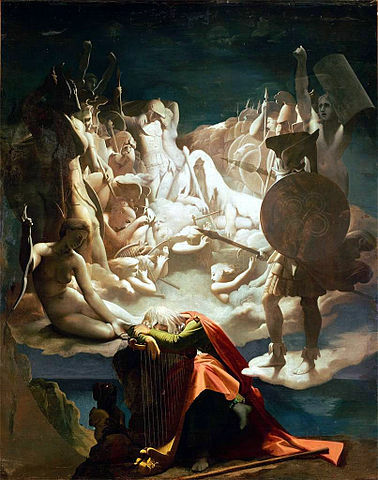 Ossian’s cycle of epic poems was published by the Scottish poet James Macpherson beginning in 1760. Though Macpherson claimed the material originated from ancient Gaelic sources, many – including Samuel Johnson – criticized the work as a forgery, written by Macpherson himself. When Napoleon learned, on St. Helena, that the wife of British Admiral Sir Pulteney Malcolm hailed from Scotland, he asked her if she knew Ossian’s poems. In 1800, Napoleon appointed Louis Ripault, an antiquarian who was a member of the Egyptian expedition, as his personal librarian. When Ripault proved to be too liberal, he was replaced in 1804 by an elderly Italian historian, Carlo Denina, author of The History of the Revolutions of Italy, which Napoleon had read as a student. In 1807, Denina was succeeded by the librarian Antoine-Alexandre Barbier. Napoleon expected his librarian to be on call at all hours to read to him, to report on new books, to find sources of information on particular subjects, and to summarize content. Dissatisfied with the camp libraries formed for his use, in July 1808 Napoleon dictated from Bayonne instructions for Barbier to create a purpose-built travelling library. The Emperor wants a portative library of thousand volumes in 12mo., printed in good type, without margin, and composed as nearly as possible of 40 volumes on religion, 40 of epics, 40 of plays, 60 of poetry, 100 of novels, 60 of history, the remainder, to make up the 1,000, of historical memoirs. The religious works are to be the Old and New Testament, the Koran, a selection from the works of the Fathers of the Church, works respecting the Arians, Calvinists, a Mythology, &c.
Among the novels were to be the masterpieces of Fielding, Richardson and Le Sage. For the 1809 campaign against Austria, Barbier prepared a substantial library, arranged in a series of large mahogany cases, which could be opened up into instant bookshelves (the cases were later exchanged for leather ones, considered more durable). Dissatisfied that some books had to be omitted because of their bulk, Napoleon in June 1809 sent instructions from Vienna for Barbier to compose an even larger travelling library of historical works, in even smaller size. During the retreat from Moscow, a number of boxes of books from Napoleon’s travelling library were burned by the French. It was while he was on St. Helena that Napoleon read his brother Lucien’s Charlemagne. What happened to Napoleon’s library? 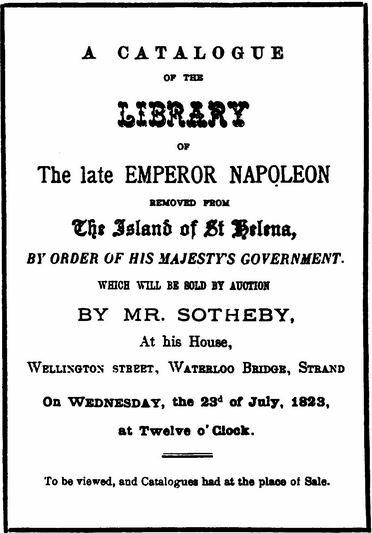 By 1821, when Napoleon died, his library consisted of 1,814 volumes, 1,226 of which had been shipped from England. (15) In his will, Napoleon directed Saint-Denis to take care of “four hundred volumes, selected from those in my library of which I have been accustomed to use the most” and to convey them to his son, the King of Rome (Napoleon II), when he reached the age of 16. Napoleon’s companions took what they liked from the rest of his books. The remainder were purchased by the bookseller Bossange and Co., which organized an auction by Sotheby’s in London on July 23, 1823. The catalogue listed 123 items, 10 of which were letters signed by Napoleon. A few volumes were given to members of Napoleon’s family. When General Bertrand died, all but about a dozen of the volumes belonging to his estate were sold for scrap. Even if you don’t understand French, you will be able to decipher some of the titles remaining, as well as those listed in the auction catalogue, in La Bibliothèque de Napoléon à Sainte Hélène by Victor Advielle (Paris, 1894). 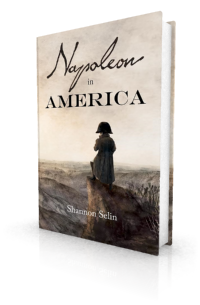 For more about Napoleon’s book reading habits, see the three-part article on “Napoleon the Reader” by Ira Grossman on the Napoleon Series: “The Early Years”; “The Imperial Years”; “The Final Years”. 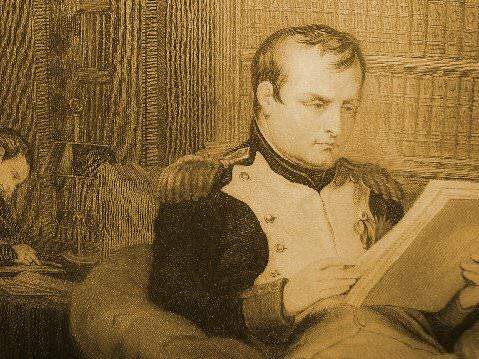 Margaret Rodenberg has written a lovely piece about Napoleon’s reading habits on St. Helena on her Finding Napoleon website. Louis Antoine Fauvelet de Bourrienne, Mémoires de M. de Bourrienne sur Napoléon, le Directoire, le Consulat, l’Empire et la Restauration, Vol. I (Paris, 1829), p. 33. Du Casse, ed., Mémoires et Correspondance Politique et Militaire du Roi Joseph, Vol. I (Paris, 1855), pp. 32-33. Clementina E. Malcolm, A Diary of St. Helena (1816, 1817): the Journal of Lady Malcolm, edited by Sir Arthur Wilson (London, 1899), pp. 24-25. Bourrienne, Mémoires, Vol. II, pp. 49-50. Constituted by French general and scholar Louis Caffarelli du Falga with the help of the economist Jean-Baptiste Say, the Egyptian campaign library consisted of about 320 volumes, over half of them historical. A. Bingham, ed., A Selection from the Letters and Despatches of the First Napoleon, Vol. II (London, 1884), p. 400. “Book Collectors,” Lippincott’s Magazine of Literature, Science and Education, Vol. VII (Philadelphia, 1871), pp. 310-311. A Selection from the Letters and Despatches of the First Napoleon, Vol. III, p. 167. Louis Étienne Saint-Denis, Napoleon from the Tuileries to St. Helena, translated by Frank Hunter Potter (New York and London, 1922), p. 75. A Selection from the Letters and Despatches of the First Napoleon, Vol. III, p. 412. Edward Edwards, Libraries and Founders of Libraries (London, 1865), p. 139. Louis-Joseph Marchand, In Napoleon’s Shadow (San Francisco, 1998), p. 333. It’s not clear what the books consisted of. Marchand refers to Napoleon taking notes on Lacratelle, a French historian and journalist. Emmanuel-August-Dieudonné de Las Cases, Mémorial de Sainte Hélène: Journal of the Private Life and Conversations of the Emperor Napoleon at Saint Helena (London, 1823), Vol. II, p. 275. Napoleon from the Tuileries to St. Helena, pp. 188-190. Libraries and Founders of Libraries, p. 139. In Napoleon’s Shadow, p. 333. What a wonderful article! An inspiration for all of us bibliophiles. Thanks, Tom. So glad you enjoyed it. I.too,find the article very good. Gives a good summary of what Napoleon liked to read. I would like to add one book that he also liked: Paul et Virginie, by Bernardin de Saint-Pierre. That gives a good insight into what his more private inclinations may have been. Thanks, Irene. Bernardin de Saint-Pierre was also one of Joseph Bonaparte’s favourite authors. I find it interesting that men of Napoleon’s day looked to Roman history rather than that of what was then more recent times. We had an exhibit in St. Louis that emphasized that, because Napoleon wanted a break with the French monarchy, he drew on Roman themes and symbols. I have also read that American Revolutionary figures, such as John Adams and Thomas Jefferson, read heavily in Roman history rather than British or what little American history there was to that time. Someone hurled an insult “He is a Catiline”, a phrase that would send most, if they were curious enough, running to their computers to google the name. That is interesting, Jim. I gather that schooling at the time, on both sides of the Atlantic, placed a great emphasis on a classical education, which must have influenced subsequent reading and intellectual development. Certainly Napoleon fixed on his heroes (Caesar, Alexander) early on. I must admit that in reading 19th century sources, I’ve often had to google references to classical works and figures that people like Napoleon, Louis XVIII, John Quincy Adams, etc. regularly tossed around. Classical education was the non plus ultra of the day. In whatever European (and American) system.They were all stuffed with Greek and Latin Literature, the men of the French Revolutionary Assemblies ran around in Roman Togas and Sparta was a model for all of them (including George Washington).That was the Fashion of the day,visible also in Architecture and Painting (Neo-classicism). If Napoleon drew on Roman symbols,I think it was not because of a break with the preceding French monarchy, it was rather a legacy of the Revolution and, of course, it probably was a reflection of his own tastes, both military and political. The Revolution tended to emphasise more the Roman Republic while Napoleon leaned more towards the Roman Empire. But he also used some post-Roman symbols,such as the bee (borrowed from the Merowingians). Quote from The Lowe Papers, British Library Manuscripts Dept. Thanks, Lally, and thanks for the extract from the Lowe Papers. It gives a good sense of the regimen around Napoleon on St. Helena. Just imagine Sir Thomas Reade meticulously leafing through all those books. I agree, Shannon. It illustrates how incredibly smallminded Sir Hudson Lowe was in the execution of what he thought was his job. Sir Thomas Reade, by the way, detested Hudson Lowe. His diaries, that are published, attest to that. Hudson Lowe was universally disliked, not only by the French exiles. Rather a nice job compared to his usual duties probably. Surprisingly Gov. Sir Hudson Lowe used to send books from his own Library at Plantation House to Napoleon for him to read. Napoleon used to jot pencil notes in the margin before returning them! Are any of those books still at Plantation House, Lally? I wonder if Lowe went through and read what Napoleon had jotted down. Re. Bernardin de Saint-Pierre: Georges Bertin, Joseph Bonaparte en Amerique, pp. 108, 142. Re. Hudson Lowe lending books and Napoleon jotting notes: Frances Hume translation of Paul Fleuriot de Langle, Memoirs of General Bertrand, p. 6. The books that Hudson Lowe sent to Napoleon were not suspicious as they were sent by Hudson Lowe himself and did not contain any clandestine messages, that Lowe suspected might have been hidden in books coming in from outside. He was noted for his paranoid suspicions. I think Irene Hartlmayr may be confusing Sir Thomas Reade with Major Gorrequer. The latter’s diaries were later published, but I don’t think Reade ever kept a diary. I have seen a few unpublished pages he wrote whilst on St. Helena – totally unmemorable and inconsequential. If anything Reade thought Lowe was too soft on Napoleon and on one occasion said if it were up to him he would take away Napoleon’s books. Thanks, John. I haven’t seen anything written by Reade, who has a very appropriate name for this post. It’s interesting to learn what he thought of Lowe’s treatment of Napoleon. I still want to read “Ossian”, but I did read “Paul and Virginie”, as it was also one of Louis Bonaparte’s favourite novels. Napoleon used to say of Louis that he had read too much Rousseau; I haven’t been able to hold a book by Rousseau in my hands without thinking of that quote. You’re most welcome, Pim. Glad you liked the article. If you haven’t already read it, you might enjoy my article about Napoleon’s meeting with Goethe. Reading about the emperor’s private life and reading habit is like meeting him in person. It really was delightful reading about the avid reading habit of one of history’s most outstanding personalities. It’s also very interesting to know that he was a staunch lover of history, which happens to be my delight. Thanks, Joseph. I’m glad you liked the article. Didn’t happen to see any mention of the novel he, himself, wrote as “Clisson”. Thanks for bringing that up, Lawrence. When Napoleon was in his mid-twenties, he wrote a novella called Clisson et Eugénie, about the doomed romance between a soldier and his lover. 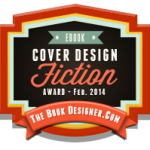 I refer to it in my article on Napoleon in historical fiction. I haven’t seen any reference to Napoleon re-reading the manuscript in later life. When we see the authors that he admired, we have to conclude that Paoli was correct. He was a dictator that betrayed the French Revolution. I find this site very useful, even magical. Thank you very much. You’re welcome, James. Glad you’re enjoying it. [Napoleon] would run to the library, where he read with great eagerness books of history, particularly Polybius and Plutarch. He also especially liked Arrian, but had little taste for Quintus Curtius.